Yasiel Puig's first week in the majors was nothing short of amazing. The Dodgers outfielder has quickly emerged as 2013's it player, both on the field and in the hobby. While he was highly touted ahead of his call-up, prices on Yasiel Puig baseball cards have soared as collectors clamor to get in on the excitement. 2013 Bowman Baseball has been out for about a month now. This is the first set to feature Puig in a Dodgers uniform. While he's not in the base or Prospect sets, he is a part of a pair of inserts. When 2013 Bowman Baseball arrived, the Yasiel Puig Cream of the Crop Mini Refractor could be found regularly on eBay for $10 or less. Most of the Blue parallels, which are numbered to 250, sold in the $25-40 range. Now the regular versions are selling for $50. 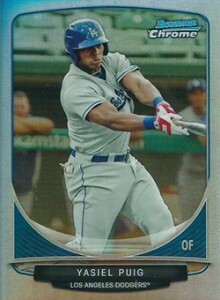 Blue Refractors were up to about $60 at the time Puig debuted with the Dodgers. A week later and they're now selling for $150. The Yasiel Puig card to get in 2013 Bowman Baseball has become Lucky Redemption #4. He wasn't named to the set until he made the Los Angeles roster. When the set first released, it sold for about $150-200. The latest copies to sell have reached $900. Redeemed copies of the Yasiel Puig Lucky Redemptions come with an on-card autograph. There has been a renewed interest in several 2012 products from Leaf that have the first certified Yasiel Puig autograph cards. In just the last week, Puig's 2012 Leaf Metal Draft autograph went from a $60 card to one that moves for as much as $300 (though the last one to sell barely broke the $200 barrier). His base 2012 Leaf Valiant autograph has gone from $86 to more than $400. A one-of-one autograph parallel from 2012 Leaf Ultimate Draft sold on June 5 for $3,050. With these soaring prices, there has also been renewed interest in boxes that hold the potential for Yasiel Puig autographs. It's tough to imagine Puig maintaining the numbers he showed during his first six games. He hit safely in all but one of them, four of which were multi-hit outings. The Cuban notched four home runs and knocked in ten runs. He also played tremendous defense in the Dodgers outfield. For now, at least, there's no stopping Yasiel Puig or his cards. Hi. I have a bid for a 2013 Topps Pro Debut Yasiel Puig SSP 35b card. I can’t tell by looking at the front or back that it has a SSP printed on it. How do I know it’s actually a short print? Many thanks! !